Check out this year's 2nd annual Tour de Hives put on by the Zenger Farm Bee Group. The Zenger Farm Bee Group has organized Portland's second annual Tour de Hives and it's taking place in backyards near you on Saturday, August 18th in celebration of National Honey Bee Day. 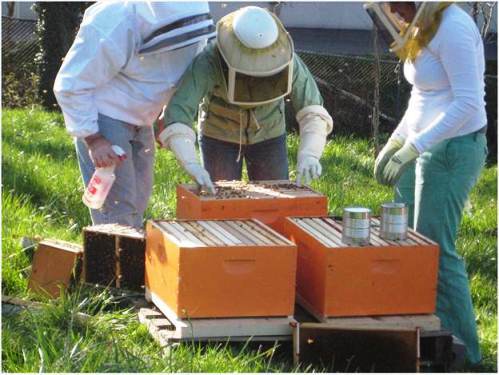 Local backyard beekeepers will host self guided apiary tours throughout the Portland area from 1-4pm in order educate the public about urban beekeeping and how to be a good steward of the honeybee. Tickets can be purchased online at the Tour de Hives website at a sliding scale of $5-15. Children are free with an adult. All proceeds benefit Zenger Farm. I'm not sure if I'll be back in town by then but if I am I hope to see you there. Sounds fantastic. One week prior to the event, a tour map and site addresses will be emailed to ticket purchasers. For the self-guided tour participants transport themselves to each site, and set their own pace exploring a wide spectrum of urban beekeeping styles. A full list of tour guidelines is available online. And I think that they're still looking for volunteers if you're interested in lending a hand. Following the event from 4-6 p.m. tour participants are encouraged to head to the Lucky Lab on Southeast Hawthorne to continue the conversation. For more information, contact Sydney Mead at sydney@ecotrust.org, or visit the Tour de Hives website. Founded in 1999, Zenger Farm is a working urban farm that models, promotes and educates about sustainable food systems, environmental stewardship, community development and access to good food for all. It now consists of 9.7 acres of farmland and wetland in outer southeast Portland. For more information visit www.zengerfarm.org. Tour de Hives 2012 www.tourdehives.com Organized by Zenger Farm Saturday, August 18 Self-Guided Apiary Tours: 1-4 p.m. Post Event Gathering: 4-6 p.m. at Lucky Lab (915 SE Hawthorne Blvd.) Tickets can be purchased online at a sliding scale of $5-15. Children are free with an adult.